in categories . . . Note: You may download this resource at no cost, for personal use or for use in a Christian ministry, as long as you are not publishing it for sale. All I ask is that you give credit where credit is due. For all other uses, please contact me at mark@markdroberts.com . Thank you. Part 3 Less Time of Websites, More Time for Witnessing? Part 4 Less Time for Blogging, More Time for Baptizing? Part 5 Less Time for Computers, More Time for Converts? Part 6 Less Time for Wireless Telephones, More Time for Winning People to Jesus? Denominational politics is never pretty. This has been seen clearly in the recent actions of my denomination, the Presbyterian Church USA. The political maneuvers of some Presbyterians have led us to the brink of schism. Sigh! Time Magazine published a story on the rise of the bloggers among the Southern Baptists. Apparently, a bunch of young pastors, feeling excluded from the denominational hierarchy, began to use blogging as a way to express their frustration and rally the troops. This ended up in a most surprising way, with the election of dark horse candidate for president of the convention. Dr. Frank S. Page defeated the heir apparent, Dr. Ronnie Floyd, in part because of the support of blogging Southern Baptist pastors. Time quotes a veteran Baptist journalist, "Without the bloggers Page wouldn't have been elected. He was a relative unknown, and the bloggers really have created the whole conversation. It's very much a generation shift." Yep. A generation shift. A new way of doing business, with bloggers leading the charge. This doesn't surprise me, really. Blogging is simply a way for people to communicate effectively with a wide number of people. Communication influences people, including Southern Baptists, it seems. It changes minds and affects how people vote. Blogging is just one tool in the communication arsenal. I do find it ironic, however, that in yet another sphere bloggers are upsetting the apple cart and making the apple cart owners angry. We've seen this again and again in the mainstream media. Now the power of blogging is influencing denominational structures. What's common in both instances is that the institutional gatekeepers (major media outlets, Southern Baptist hierarchy) are losing power, and aren't very happy about it. It's common these days for mainstream media commentators to bash the bloggers, suggesting that they are a trivial annoyance. Well, as it turns out, the Southern Baptist hierarchy also took a swipe at the bloggers. I'll examine this in my next post. In my last post I explained how bloggers recently had a major and unexpected impact on the politics of the Southern Baptist Convention. The response of Baptist officials was typical. Even as mainstream media pundits bash the bloggers, so did the outgoing Southern Baptist President. Welch said he’d been wondering about Southern Baptists and that if “we’d spend less time on these websites that we’d be able to spend more time witnessing? “Do you think if we spent less time blogging we might have more time to do some baptizing? Welch advised the crowd not to gloat that he’s chiding “them bloggin’ boys. Why, you run around with that wireless telephone up in your ear all day long like a pacifier. The article did not mention whether or not Bobby Welch said anything about how the bloggers had impacted the election of the next president, a man Welch did not prefer, apparently. I expect he left this out. But I find it curious, and telling, that in the aftermath of the SBC election, Welch decided to go after the bloggers. It would be easy to dismiss Welch's opposition to blogging as the ravings of an icon of an aging generation. The world has changed, and Welch is not happy about it. Somebody moved his cheese, as it were. But I want to pause and think about what Welch said. His questions deserve serious answers, I believe, even if he meant them as rhetorical slaps in the faces of uppity Southern Baptist bloggers. Moreover, I think Welch isn't entirely out of line in what he says. In my next post I'll begin to look critically at his comments. Less Time on Websites, More Time for Witnessing? In his final sermon as the outgoing president of the Southern Baptist Convention, Bobby Welch expressed his unhappiness with the bloggers of his denomination. I cited several of his comments in my last post. Today, and in the days ahead, I want to respond to Welch's concerns in some detail. According to BPNews, "Welch said he’d been wondering about Southern Baptists and that if "we’d spend less time on these websites that we’d be able to spend more time witnessing?'" In case you're not familiar with conservative Christian lingo, witnessing is another word for evangelizing. It usually describes what others might call personal evangelism: one-on-one conversation about Christ with the purpose of converting a non-believer. Baptists believe that all Christians should witness, that is, should "share Christ" with people around them. I'm not a Baptist, but I also believe this. I realize that this isn't conducive to postmodern relativism, but a consistent relativist will at least allow me to believe what I in fact believe. I do believe that Christians should share the good news of Christ with others. I do not defend rudeness or arrogance, however. Personal evangelism doesn't have to be obnoxious, though some well-intentioned Christians seem to prove the opposite point. Evangelism, in its literal meaning, simply telling others about something good. If I see a good movie, I want to tell my friends. If I read a good book, ditto. So how can I not share the best news in life? I've said this to make it clear that, though I might not sound like Bobby Welch, I agree with his idea that we Christians should "spend more time witnessing." But does that necessarily mean we should "spend less time on these websites"? Well, it all depends on the content of the websites, doesn't it? To take the simplest case, a website might be a way for communicating the gospel, rather like an online tract. Time spent doing a website might be time spent witnessing. But even if a website isn't overtly evangelistic, it seems to me that blogging enables Christians to engage the larger world. Though my website occasionally evangelizes in the narrow sense (through my sermons, largely) I am regularly engaging the ideas, concerns, and values of the world in which I live. 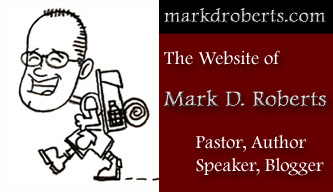 My website helps me to interact with the culture in a way that might be called "pre-evangelistic." It helps me to know the people to whom I'm called to witness, and it helps me to enter into constructive dialogue with them. My guess is that Bobby Welch, given his perspective on the Internet, hasn't spent too much time checking out various Christian blogs. No doubt he thinks of blogging largely in terms of Southern Baptist politics. I'd recommend that he spend some time reading the blog of Albert Mohler Jr., president of The Southern Baptist Theological Seminary. Here Welch would find serious engagement with the culture from a clear, conservative, evangelical Christian perspective. If Christian blogging can have value, even from an evangelistic point of view, does this mean it's just fine for Christian bloggers to spend all the time in the world on their websites? Of course not. Though he didn't put it this way, what Bobby Welch should have said is that we all need to think about how we spend our limited time on this globe. Blogging can be an enjoyable hobby, even an effective ministry. But it can also be a time-waster, a distraction, or an obsession. I would confess that there have been times when my blogging has taken me away from more important activities. So, though I don't agree exactly with Bobby Welch's either/or position, either websites or witnessing, I do receive his challenge to look carefully at how I spend my time and to re-think my "mission" in my own website. Less Time for Blogging, More Time for Baptizing? Bobby Welch, the outgoing president of the Southern Baptist Convention, doesn't like blogging. In my last post I examined a line from his swan song sermon at the recent SBC meeting. He wondered if "we'd spend less time on these websites that we'd be able to spend more time witnessing?" Staying on his alliteration roll, Welch asked, "Do you think if we spent less time blogging we might have more time to do some baptizing?" I'm tempted to ask a rhetorical question back in Welch's direction: Do you think if we spent less time messing around with church politics we might have more time to do some baptizing? I freely admit that blogging can be a waste of time. But so can church politics. In fact, there are few things that are more hurtful to the cause of Christ than church politics run amuck. When Christians bash each other, play power games, and outdo the world in worldliness, this doesn't exactly draw the heathen into the kingdom. Of course not all church business is like this. But much of it is. Bobby Welch may be a wonderful man and a wonderful pastor. I have no reason to believe otherwise. But it's obvious that he hasn't thought much about how to reach the younger generations with the gospel. To be sure, face-to-face relationships matter to these generations, as to the rest of us. But folks under thirty are techies. They live in an e-world, where the Internet is as normal as the telephone system. E-mail, blogging, websites, online chat rooms, Myspace – all of these are simply normal tools of living for people born after 1980. If we're going to communicate with them, we need to speak their language and use the modes they use. Eric, my high school director, does lots of ministry through the Internet and through text messaging by way of cell phones. He stays connected with more than a hundred kids by a wise use of technology. Eric also understands the importance of personal contact. He's always hanging out with kids. But the Internet is a valuable tool in his collection. I don't know for sure, but I wouldn't be at all surprised if Eric knows kids who first got interested in our youth group by way of the Internet. And if it hasn't happened yet, I expect that before long we'll be baptizing some new believer because of the Internet. I'm baptizing a high school girl by immersion. You may notice that we Presbyterians don't have state of the art baptismal pools. My answer to Bobby Welch's question on blogging and baptizing is this: It just may be that if we Christians spent more time engaging the culture and the people around us through blogging, then we'd end up needing to spend more time baptizing as well. Why give up a potentially powerful communication tool, especially when that tool has such impact among younger generations? Less Time for Computers, More Time for Converts? Bobby Welch, past president of the Southern Baptists, isn't too fond of technology. In his last sermon as leader of the Southern Baptist Convention he asked if we should spend less time on websites and more time on witnessing, less time blogging and more time baptizing. Then, completing his trinity of alliteration, Welch asked: "Do you think if we spent less time fumbling around with those computers we might have more converts?" Just for fun, I thought it would be interesting to check out the website for Bobby Welch's church, The First Baptist Church of Daytona Beach (Florida). So I did. First of all, the church website is graphically sophisticated. There's no "fumbling around" here. The layout is superb. There are elements of Flash technology (movement), but nothing too complex. This church either has a professional web designer/master, or they outsource to professionals. Obviously, First Baptist of Daytona Beach takes serious the need to use technology to maximum advantage. Yet I find the excellence of this website to be strangely inconsistent with Welch's negativity about computer technology in his sermon. Hmmmm. Second, I noticed on the page that described the pastors of First Baptist that Bobby Welch has an e-mail link. I guess that's one technology he's not opposing. The funny thing is that I find e-mail to be perhaps the single greatest consumer (waster?) of time that I might otherwise be investing in converts. If I were Bobby Welch, I might have gone after this distraction. Core Value #1. The Lordship and Sovereignty of Jesus Christ – In all we are and do, our foundation and focus will always be the honor and lordship of Jesus Christ and all things will be for His glory. Furthermore, understanding that with God all things are possible, our mission and ministry shall be limited only in those ways God Himself determines. We shall allow our hearts, minds and souls to be stretched by the heart and hand of God as He shapes and fashions us as a Church according to His perfect will. My comment: Could blogging be one way of doing ministry, one of the "all things" that are possible with God? Core Value #6. An Emphasis on Evangelism and Missions – We believe that Jesus Christ alone is the way to salvation. Our ministry calls for a strong emphasis on taking the Good News of Jesus Christ to this community and around the world. My comment: Couldn’t the Internet be a powerful tool for "taking the Good News of Jesus Christ" to our local communities and to the world? In the two and a half years of my blog, I've received e-mails from readers on six continents. No readers from Antartica, as far as I know. Core Value #11. Freedom to Innovate and Change – We recognize the eternal and unchanging nature of God’s Word but we also recognize an on-going need for ministry change and innovation in order to effectively facilitate the sharing of the Word and growth of God’s kingdom. An atmosphere of grace shall prevail when our innovative methodologies are deemed ineffective. My comment: This is an excellent statement, don't you think? I only wish Bobby Welch had remembered it as he was preparing his sermon. This statement would seem to call forth an aggressive effort to use new technologies for the sake of the kingdom. It may seem like I'm picking on Bobby Welch. If so, I apologize. I'm not trying to show him up so much as to show how his own church is much more engaged with technology than his sermon might suggest. Sometimes sermons use hyperbolic rhetoric that simplifies or distorts reality. Core value statements, like the one adopted by Bobby Welch's church, tend to be more thoughtful and balanced. Bobby Welch the preacher asks: "Do you think if we spent less time fumbling around with those computers we might have more converts?" Bobby Welch the pastor answers: "[U]nderstanding that with God all things are possible, our mission and ministry shall be limited only in those ways God Himself determines. . . . Our ministry calls for a strong emphasis on taking the Good News of Jesus Christ to this community and around the world. . . . [W]e also recognize an on-going need for ministry change and innovation in order to effectively facilitate the sharing of the Word and growth of God’s kingdom." Or, to put it differently, maybe time spent fumbling around with computers will lead to more converts. Less Time for Wireless Telephones, More Time for Winning People to Jesus? Today I'm finishing up a six-part series: On Baptists and Blogging. I was inspired to get into this topic by a sermon delivered by Bobby Welch, the outgoing president of the Southern Baptist Convention. In this sermon, Welch came down hard on computer folk, especially on bloggers. I've shown in previous posts that his perspective might be too narrow, though he is right to challenge us to think carefully about our use of time in light of God's kingdom. I'm assuming that, by "wireless telephones," Welch means what most of us would call "cell phones." The image of cell phones "up in your ear all day long like a pacifier" is a humorous one, to say the least. Some of us certainly are addicted to cell phones. I was recently on the campus of Georgetown University in Washington D.C. right after classes were breaking up. I was amused to see dozens of students rush from class with cell phones jammed to their ears. What was so urgent that it couldn't wait? And whatever did we do before we had cell phones? Talk to people from our classes, I suppose. No doubt Bobby Welch has a point here. We can use our cell phones to keep us in touch with our friends, but this may cut us off from others, including, as Welch says, those we should be winning to Jesus. Yet I find Welch's imagery rather dated. He wants us to spend less time with cell phones and "more time on the street." On the street? Is this the best place for evangelism? Perhaps it is in Daytona Beach, especially during heavy tourist seasons. But where I live, street evangelism would be silly. We're a car culture, not a walking around culture. And if people are out walking, they're usually in a hurry, trying to get from one store to another. They aren't sauntering about looking for conversation. As I mentioned previously in this series, my high school director keeps in touch with dozens of kids by use of cell phone, especially text messaging. If he spent more time in the streets and less time with his wireless phone, he'd win fewer people to Jesus, not more. For me, one contemporary version of the "street" is the coffee bar. I've had ten times as many conversations about God in Starbucks or Tully's or It's a Grind as in all the streets of Irvine combined. The other contemporary version of the "street" is, ironically enough, the Internet. Through my blog and e-mail conversations it has engendered, I've had literally hundreds of interactions with non-Christian people during the past two and a half years. We recognize the eternal and unchanging nature of God’s Word but we also recognize an on-going need for ministry change and innovation in order to effectively facilitate the sharing of the Word and growth of God’s kingdom. It seems to me that this sort of commitment demands that we take seriously the pluses and minuses inherent in all forms of ministry. But to dismiss the Internet and cell phones out of hand seems just as unwise as naïve endorsement of technology just because it's "hot." We must look creatively and critically at all the tools available for ministry, and use these tools wisely.